Once again, Locomalito has ported one of his games over to Linux. This calls for the usual post, although i'm a bit late this time around. Personally, I consider Maldita Castilla to be one of his best games, so I'm happy to see it find its' way on to Linux after all of the time I spent playing it on Windows. Like Locomalito's other games, Maldita Castilla is a game designed with old-school aesthetics and values in mind. In this case, much inspiration seems to have come from platformers like Ghosts 'n Goblins. You play as Don Ramiro, a knight on a quest to stop the evil plaguing the land of Tolomera. This game is really well polished. The music not only uses proper soundchip emulation in order to sound as authentic as possible, but it sounds great as well. The gameplay feels like it came straight out of an arcade, with the stiff-but-predictable control that you'd expect from a number of games of that era. 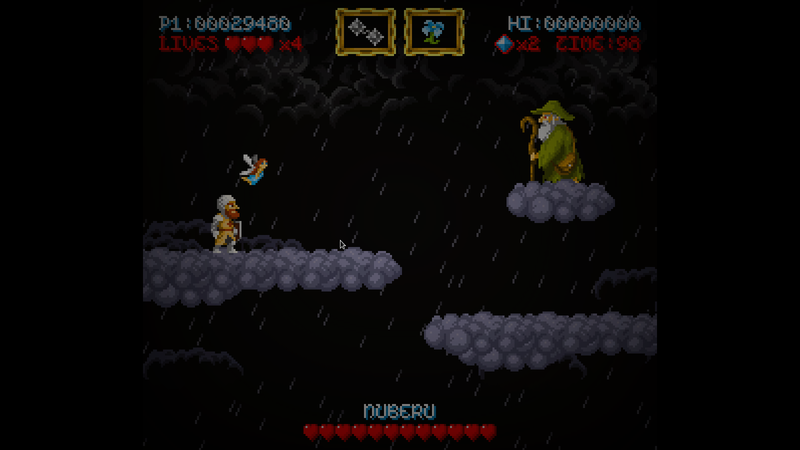 The graphics are vibrant and seem to adhere to palette restrictions, for a complete old school look. The game itself is a blast to play, and mastering a level feels great. 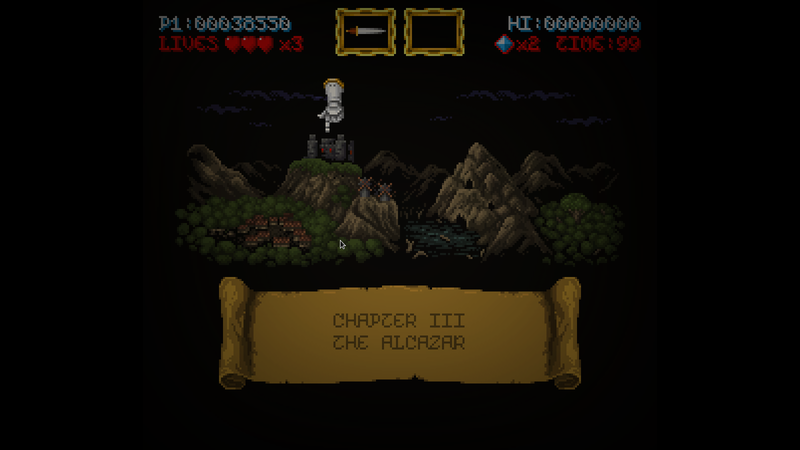 At this point, I can blitz through the first two levels like some kind of medieval ninja! The game loosens some of its' restrictions when it comes to death. You get 4 continues after running out of lives, and you can sell your soul for infinite continues if you wish. You won't get a very good ending then, but at least you can keep going even if you get stuck. The game also has a ton of cool hidden things that you can easily miss the first time around, adding to the replay value. The end even provides you with a handy checklist of what you did/didn't miss. 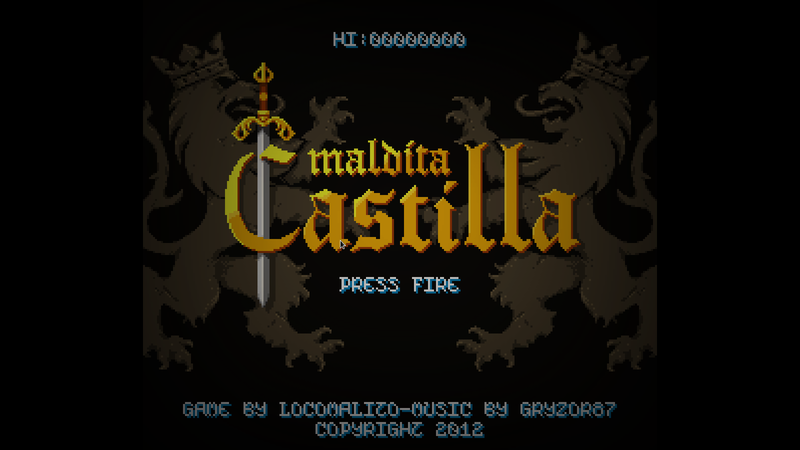 In keeping with the tradition, Maldita Castilla is blisteringly difficult. I enjoy the challenge, but there are a few areas that feel incredibly unfair until you've passed them a few times. Losing any powerups you had when you die can make this problem even worse. While you can still certainly prevail with the basic starting weapon, it still can make an already frustrating bit even worse. Additionally, there is no options screen that I know of, just a handful of keys hidden in a readme. The game would also benefit from some kind of extra mode, be it local multiplayer, or a boss rush, or something of that sort. It's not much of a complaint, but it'd be nice to see. In the end, the both the best and worst thing about Maldita Castilla is that it provides a very authentic feeling arcade experience. It's a wonderful throwback to old times, but its' difficulty is brutal and merciless. It's wonderful fun though, and I'd highly recommend it to anyone who enjoys platformers, especially those harkening back to a simpler, tougher time. The only people that I'd specifically discourage from playing this would be easily frustrated gamers. If you rage easily, then this game is probably not for you. As for everyone else: give it a shot! After all, it's free.